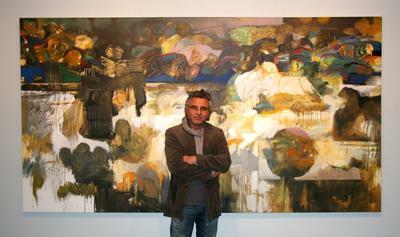 Hessam Abrishami is still driven by the deeply felt values that he developed during his early days in Iran and Europe. Understanding the struggles encountered by emerging artists, Hessam has always been willing to help new artists develop their careers. Hessam believes strongly in the goodness of people and this world, which is reflected in not only his art, but in his personal values. Hessam additionally creates some artistic statements that defy oppression. When asked if it is difficult to see a favorite painting leave in the arms of a collector, possibly never to be seen again, Hessam has said, “No, I have enjoyed making it and now I want it to bring happiness to someone else.” He goes on to express that the artwork does not belong solely to the artist, but in fact, it belongs to the people. Hessam’s art is his way of helping to make the world a free and joyful place. Hessam’s approach to art is intuitive and free by nature, yet disciplined by his strong foundation in artistic fundamentals.